If you are looking to mix up your home decorations in 2013, now is a good time to start planning ahead! Here are some of the upcoming hottest trends in home furniture! 1. Green – Green is one of the most natural colors. In the spring time, green is everywhere: the grass, the trees, the flowers, etc. Green is going to be huge in 2013. In fact, emerald green is the color of the year for 2013! Green is so great because every shade of it works with just about all the other shades of green. Natural fabrics in cream and oatmeal colors will be extremely popular. You will see a lot of metal accents on furniture moving to warmer metallic tones such as gold and brass rather than silver and pewter. 3. Back to the 1940s – Think old school pastels. Yellow, coral, orange and turquoise. We’re going back in time. Use these colors as accents to your neutral/natural colors on furniture! 4. Painted wood trimming – Painting wood white, black or cream is a good look. 5. Bold Fabrics – Bold fabrics can make your room look bigger than it is. In 2013, look for big floral prints, with lots of white spaces. Graphic patterns can perk up a room like a bold color can without much extra work. Pillows, vases, and rugs are the easiest way to integrate these into your home! 6. Prep is back – Think bold color palettes, painted wood furniture and crazy preppy-patterns. 7. 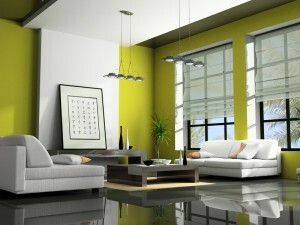 Printed accent walls – The typical accent wall is a good way to add some color into your life. In 2013, you should consider a printed accent wall compared just a painted wall. Try a wallpaper with a graphic you enjoy and will work with your current decorations. If you do not want to use a wallpaper, you can create an accent wall with a decal or stencil. Decorating your home will sure to be a fun process with these seven tips!